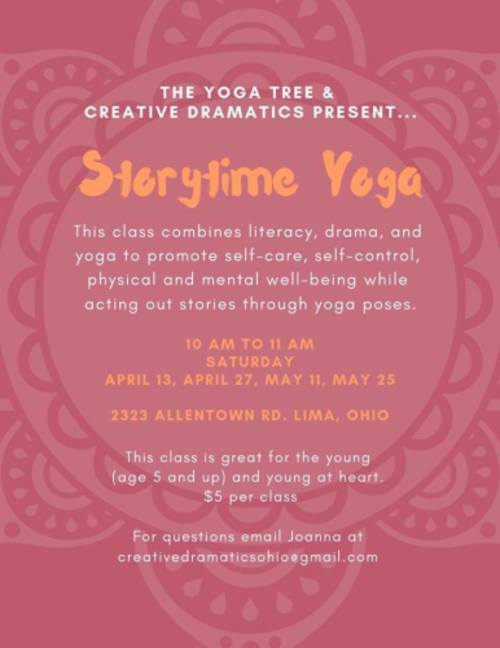 Join us for Creative Dramatics' Story Time Yoga, a class taught by local Drama and Yoga Teacher, Joanna Marie Walt. This class combines literacy, drama, and yoga to promote self-care, self-control, physical and mental well-being while acting out stories through yoga poses. This class is great for the young (age 5 and up) and young at heart (especially educators who would like to integrate yoga into the classroom). $5 per class. For questions email Joanna at creativedramaticsohio@gmail.com. Namaste!